Canine – Behavior – Is it OK if our dog sleeps in our bed? I do not know how many times a year we are asked “is it okay if our dog sleeps in our bed?” or someone with a very apologetic look on their face states, “I know I’m not supposed to, but I let the dog sleep in my bed.” The reality is there is nothing inherently wrong with your dog sleeping in your bed and contrary to popular belief, sleeping in your bed does not make a dog dominant (see Dog Behavior – Dominance: Reality or Myth). If you do allow your dog to sleep in your bed, you’re in the majority. In an informal survey I conducted via FaceBook, 75 respondents (77.32%) indicated that their dog is allowed to sleep in bed with them, whereas only 22 respondents (22.68%) indicated that their dog was not allowed to sleep with them. Is your partner comfortable with your dog sharing the bed? If not or if you are unsure, a discussion with your partner is in order. Is your dog housetrained? Until a dog is has gone at least 6 weeks without an accident inside, I wouldn’t think of allowing the dog to sleep anywhere other than a crate. Is the dog going to enjoy sleeping in bed with you or are they perhaps happier sleeping in their own crate or bed? Sleep habits vary widely between people and pets. If anyone of you is a restless sleeper, the others may be miserable. Many dogs are just as content to sleep beside your bed in their own bed or crate. Is your pet going to be safe? A small dog could easily get hurt if someone accidently rolls over on them and they may even bite in that situation. Is there room enough for everyone? A six month old Golden Retriever puppy is still growing for another 7 to 8 months. As space shrinks, allowing the dog in bed may no longer be as popular. 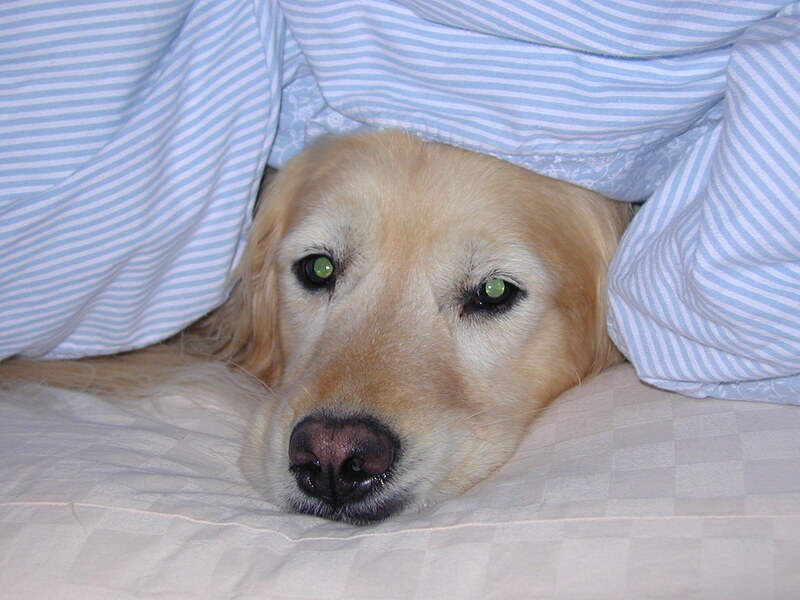 How will you feel about sharing the bed if you, your partner or the dog are sick? Some people desire closeness when ill while others cannot stand being touched. Do you have other pets and how many in bed is too many? Always keep in mind that the bed may become a valued space that one dog may choose to resource guard. My wife and I have had ten dogs in our life together and only two have had bed privileges. 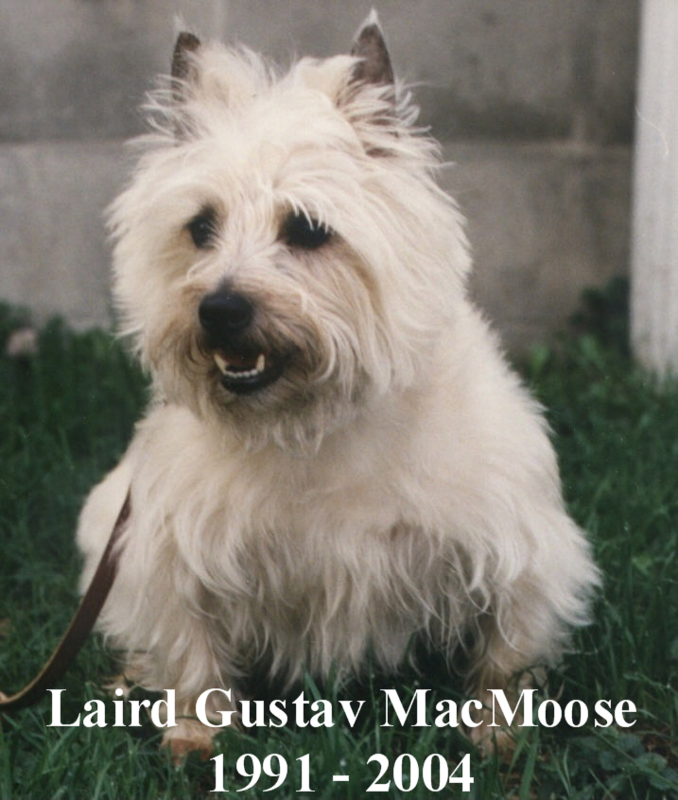 Gus, our Cairn Terrier, had privileges for a short time, but lost them because he would grumble every time we moved. He was simply of the temperament that he did not want to be disturbed when he was sleeping (I am sure we all know people like that). Gus really was more comfortable and well rested when he slept in his kennel in our bedroom rather than on the bed. Tikken, our Golden, was allowed in our bed once she was completely housetrained. During the winter months a better foot warmer could not be found however, in the heat of the summer, she would often choose to sleep on the floor. If one of us was restless, she would simply hop off and sleep elsewhere. While there were times when I described Tikken as the “great immovable object” because she would not move when I tried to stretch out, allowing her to share our bed worked well for all of us. So ultimately, the decision is up to you. There is simply no right or wrong answer about whether or not you choose to allow your dog to sleep in your bed. If it works for you, never apologize for letting your dog in your bed. If you would rather not share your sleeping space, that is okay too. Just remember, once you start letting your dog sleep with you, they will expect it. If you change the rules months or years down the road because you now have a child, a new partner, or some other life change, it will take time and work to help your dog adjust to new sleeping arrangements. Additionally, people often underestimate the value of training to both themselves and their dogs. A well trained dog is more welcome in public places and because they are easier to care for become everyone’s favorite. Because of their exemplary behavior, owners with well-trained dogs often find it easier to find rental housing or insurance and may even qualify for discounts at the veterinarians, groomers, boarding kennel and daycare. Another barrier to dog training is all of the misinformation about dog training and canine behavior, much of which is outdated and obsolete but still considered “state-of-the-art” by the dog owning public due to urban legends and the internet. 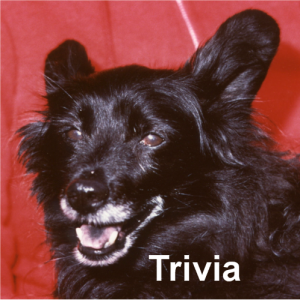 Examples of these myths are things such as suggesting that a dog needs all its shots before it can start training, that some breeds are too stubborn to be trained, that you can’t train a dog until it’s “x” months old, that a dog will learn all it needs to know from other dogs, that you just need to dominate your dog and make them mind, etc. Our knowledge about dogs, their behavior and the most humane and efficient ways to train them has changed radically in the last 15 years, but often it’s only the professional trainers that are aware of this new information. A lack of resources, both financial and time, is a further reason that people often use for not pursuing training with their pet. The reality is that compared to the purchase price of a dog, veterinary care, and a year’s worth of food, training is a bargain! If the resource one finds lacking is time, then you really need to question whether you really have time to have a dog. Working with a knowledgeable, experienced professional will actually save you time. Spending some time to learn about your dog, their breed, what they were originally bred to do, normal and abnormal canine behaviors, how they learn and how they express what they are feeling will be very beneficial. A good place to start is with the following books ; On Talking Terms with Dogs: Calming Signals by Turid Rugaas , The Other End of the Leash – by Patricia McConnell, PhD, DOGS: A Startling New Understanding of Canine Origin, Behavior and Evolution by Raymond and Lorna Coppinger, Dog Sense: How the New Science of Dog Behavior Can Make You A Better Friend to Your Pet by John Bradshaw, For the Love of A Dog – by Patricia McConnell, PhD, and Living with Kids and Dogs…Without Losing Your Mind: A Parent’s Guide to Controlling the Chaos by Colleen Pelar.